The study area includes the western boundary of the Upper Kuparuk River region and encloses a 20-km2 area surrounding Toolik Lake that stretches from the Dalton Highway on the east to Jade Mountain on the west. This includes the 1.2-km2 research grid on the south side of Toolik Lake, the old Toolik Lake pipeline construction camp gravel pad and airstrip on the northeast side of the lake and the primary terrestrial research areas on the south, west and east sides of the lake, as well as several smaller research lakes in the immediate vicinity of Toolik Lake. The Toolik Lake grid was constructed in 1989 to provide geographic referencing for experimental plots and to provide a sampling scheme for periodic measurements of snow, active layer and plant communities. Vegetation and environmental characteristics surrounding the Toolik Lake study plots were examined in August, 1989. Photography (1:5,000 scale base) for the vegetation maps in this data set was acquired in 1990. There are four compressed shapefiles (*.zip) with this data set. The shapefile data are also provided as companion files in .kmz format for viewing in Google Earth. Figure 1. 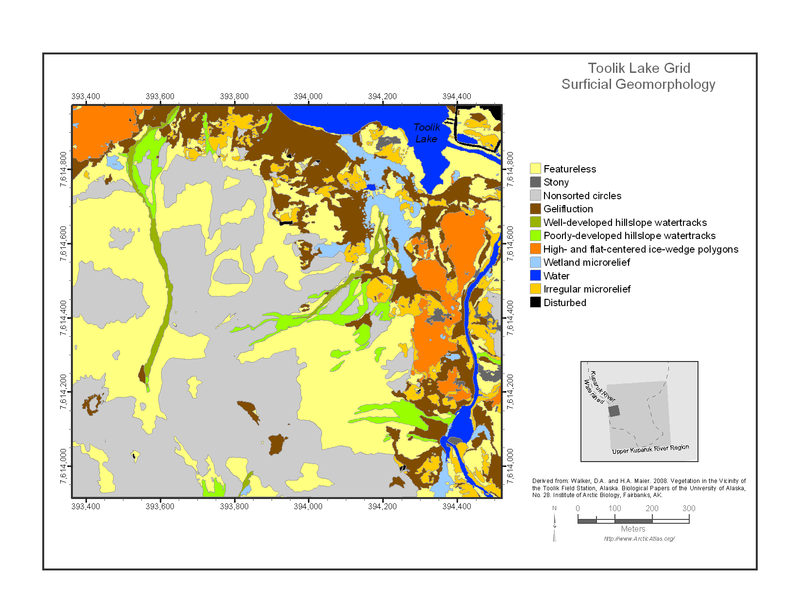 The Toolik Lake Grid Surficial Geomorphology map (Walker and Maier, 2008). This data set provides the spatial distributions of vegetation types, soil carbon, and physiographic features of the Toolik Lake area, North Slope, Alaska. Specific attributes include vegetation, percent water, glacial geology, soil carbon, a digital elevation model (DEM), surficial geology and surficial geomorphology. The study area includes the western boundary of the Upper Kuparuk River region and encloses a 20-km2 area surrounding Toolik Lake that stretches from the Dalton Highway on the east to Jade Mountain on the west. This includes the 1.2-km2 research grid on the south side of Toolik Lake, the old Toolik Lake pipeline construction camp gravel pad and airstrip on the northeast side of the lake and the primary terrestrial research areas on the south, west and east sides of the lake, as well as several smaller research lakes in the immediate vicinity of Toolik Lake. The Toolik Lake grid was constructed in 1989 to provide geographic referencing for experimental plots and to provide a sampling scheme for periodic measurements of snow, active layer and plant communities. Vegetation and environmental characteristics surrounding the Toolik Lake study plots were examined in August, 1989. Photography (1:5,000 scale base) for the vegetation maps in this data set was acquired in 1990. These data and others from nearby study areas were used in subsequent data sets, publications and maps (Shippert et al., 1995, Walker, 2016; Walker et al., 2014; Walker and Maier, 2008; Walker et al., 1995). See the related data set below (Walker, 2016) for more information. Table 3: Attributes in shapefiles 3 and 4 above (Table 1). These data could be useful as a historical baseline for climate change studies in the local region or as model validation data. The Toolik Lake study area is located near the western boundary of the Upper Kuparuk River region and encloses a 20-km2 area surrounding Toolik Lake that stretches from the Dalton Highway on the east to Jade Mountain on the west. It includes the 1.2-km2 research grid on the south side of Toolik Lake, one of the principal intensive research areas at the Toolik Lake Field Station, the old Toolik Lake pipeline construction camp gravel pad and airstrip on the northeast side of the lake and the primary terrestrial research areas on the south, west and east sides of the lake, as well as several smaller research lakes in the immediate vicinity of Toolik Lake. The area contains surfaces with irregular topography that were glaciated during the Late Pleistocene. The Toolik Lake grid was constructed in 1989 to provide geographic referencing for experimental plots and to provide a sampling scheme for periodic measurements of snow, active layer and plant communities. 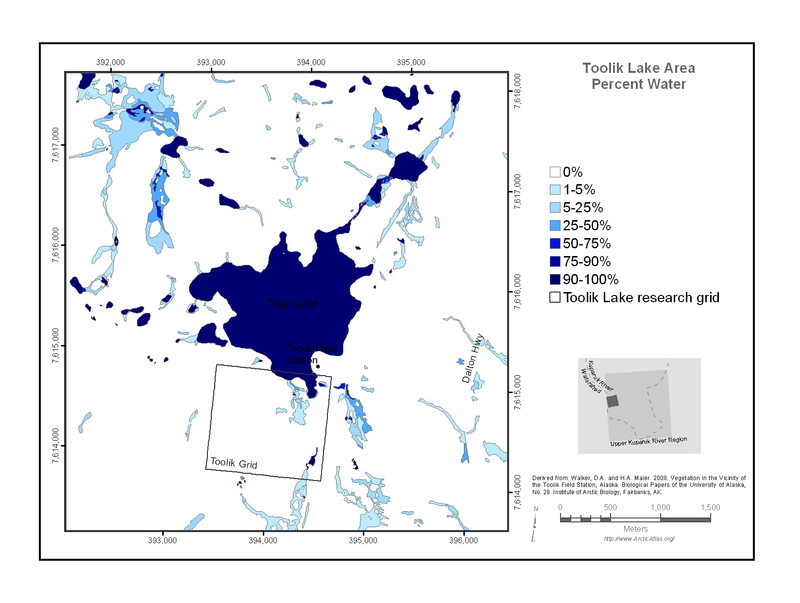 The data provided in the shapefiles with this data set include attributes from individual maps, including gridded maps, of the Toolik Lake area. These attributes are described below and include vegetation, percent water, glacial geology, soil carbon, DEM, and surficial geology and geomorphology. The Toolik Lake grid data focuses on the south side of Toolik Lake. Unless otherwise noted, the attributes are in both files. The shapefiles aga_toolik_area_veg_plot_washers_buchhorn_2014.zip and aga_toolik_grid_points_buchhorn_2014.zip provide only coordinate and elevation data; there is no additional information regarding those attributes. Vegetation and environmental characteristics surrounding the Toolik Lake study plots were examined in August 1989. Photography (1:5,000 scale base) for the vegetation maps was acquired in 1990. These data and others from near-by study areas were used in subsequent data sets, publications, and maps (Shippert et al., 1995, Walker, 2016; Walker et al., 2014; Walker and Maier, 2008; Walker et al., 1995). The vegetation data includes the physiognomy of the dominant plant communities. Forty-seven landcover types were recognized in the field (minimum mapping unit approximately 250 m2). Table 4. Codes and descriptions used for PRI_VEG, SEC_VEG, and TER_VEG attributes. 21 Dry areas with acidic soils (pH < 5.0) dominated by prostrate and dwarf shrubs (Arctous alpina, Betula nana, Cassiope tetragona, Dryas octopetela, Ledum decumbens, Salix phlebophylla, Vaccinium vitis-idaea, V. uliginosum), and fruticose lichens (Bryocaulon divergens, Cladina spp., Cetraria spp., Thamnolia spp.) Bryophytes (Polytrichum piliferum, Dicranum elongatum) are not abundant. Typically found on dry glacial till and outwash deposits, steep south facing slopes, and alpine areas in the mountains. 23 Areas dominated by Cassiope tetragona, and other dwarf shrubs (Ledum decumbens and Diapensia lapponica in acidic sites and Dryas integrifolia, Salix reticulata and S. rotundifolia in nonacidic sites) and fruticose lichens (Cladina spp. Cetraria spp., Nephroma arctica). Usually with significant components of bryophytes (Hylocomium splendens, Tomentypnum nitens) and the conspicuous forbs Boykinia richardsonii and Novosieversia glacialis. 41 Poor fen complex, wetland areas with dysic organic soils (pH < 4.5) and dominated by sedges (Carex rariflora, C. rotundata, Eriophorum scheuchzeri) and mosses (mainly Sphagnum spp.). 51 Areas dominated by willows along watertracks, streams and rivers. The amount of water (lakes, ponds, streams, wetlands), strongly affects the reflectance of the land surface over large areas of Alaska. For both the Toolik Lake and Toolik Lake grid data, the percent water was based on the number of AVHRR water pixels in each polygon divided by the number of pixels in each polygon. The classes of water coverage in a polygon were reported as follows: 0%, 1-5%, 5-25%, 25-50%, 50-75%, 75-90%, 90-100%. Figure 2. The Toolik Lake Area Percent Water Map (Walker et al., 2008). The glacial geology of the region affects a wide variety of landscape and ecosystem properties including topography, abundance of lakes, plant production, soil carbon, spectral reflectance, biodiversity, trace-gas fluxes and heat flux of the landscape. Glacial deposits within the Toolik Lake area are assigned to Itkillik I (late Pleistocene, about 120-150 kya) and Itkillik II (late Pleistocene, about 25-11.5 kya) glaciations of the central Brooks Range glacial succession. The soil carbon content in the Toolik Lake area was extrapolated from soil samples collected from different vegetation types. Values were reported ranging from <5 kg C / m2 to > 45 kg C / m2. Methods can be found in Walker & Barry 1991. This Digital Elevation Model was created from the contour lines of the Aerometrics orthophoto from 1996. In addition the 1 x 1-km Circumpolar Active Layer Monitoring (CALM) grid with 121 points (every 100 m) was resurveyed in summer 2014 with a Topcon Real Time Kinematic (RTK). This RTK data as well as a lake and river layer were included in the DEM creation. The DEM accuracy is +/- 1 m. A contour shapefile was created from the DEM, and is available for download. Surficial geology affects vegetation patterns and disturbance recovery rates. The most common units on the Toolik Lake Area map are colluvial deposits, with some glacio-fluvial, organic, and other types of surface deposits. Table 5. Surficial geology features were grouped into the following units, with respective codes and descriptions for the PRI_SGEOL and SEC_SGEOL attributes. 1 Glacial till deposit Glacial till in the region was deposited during the Sagavanirktok and Itkillik glaciations (mid and late Pleistocene). Till surfaces are generally rocky and gently undulating with blockfields, and nonsorted circles. Till on most surfaces has been covered by fine-grained colluvium that has been transported from upslope. 2 Glaciofluvial deposit Outwash deposited by meltwaters from the Pleistocene glaciers. Glaciofluvial deposits cover large areas marginal to many modern floodplains. Outwash deposits have irregular, rocky microrelief with a wide variety of landforms including kames, kame terraces, and flat terraces with high-centered polygons. 4 Colluvial deposit Hillslope deposits whose origin is due primarily to downslope movement of material under the force of gravity, but often also in association with forces due to water movement. Colluvial materials often cover other deposits and bedrock. 6 Lacustrine deposits Lake sediments occur in association with drained glacial lakes such as Galbraith Lake and along the Sagavanirktok River, and a few much smaller drained glacial kettles and ponds. The surfaces of the landscapes in the Toolik Lake area have been modified by a variety of geomorphological processes including alluviation (movement of material by water), colluviation (movement of material by gravity), and periglacial processes (freezing and permafrost-related phenomena). Common surficial geomorphological features within the mapped area include sorted and nonsorted circles (frost boils), turf hummocks, gelifluction lobes and terraces, water tracks, high- and low-centered ice-wedge polygons, wetland features and thermokarst features. Table 6. Surficial geomorphological features were grouped into the following units with respective Codes and Descriptions Used for PRI_SGEOM and SEC_SGEOM attributes. 1 Nonsorted circles Roughly circular 1-2-m diameter slightly convex barren features, spaced from 2 to many meters apart. They are composed of fine-grained mineral material that periodically undergo freezing and heaving. Nonsorted circles, or frost scars, are ubiquitous features on most hillslopes, and are not differentiated here unless they cover more than 50% of a surface. 2 Stripes Hillslopes with a striped pattern consisting of elongated relatively dry well-drained elements 1-3 m wide oriented down the steepest available slope, alternating with intervening moister interstripe elements 1-3 m wide. They are caused by combination of cryoturbation, erosion, and gelifluction. The dry elements usually are covered by nonsorted circles. Most stripes are nonsorted with similar grain size of material in the stripe and interstripe areas; sorted stripes and circles occur in rocky alpine areas. 4 Wetland microrelief Wet areas with a mixture of strangmoor, disjunct ice-wedge polygon rims, aligned hummocks, nonaligned hummocks, and lowland watertracks. Strangmoor consists strangs, which are sinuous ridges many meters long that form perpendicular to the direction of the local hydrologic gradient. Aligned hummocks are shorter features also oriented perpendicular to the hydrologic gradient. The strangs are up to 0.5 m wide and 0.5 high. Disjunct polygon rims are associated with incompletely formed or eroded low-centered polygons. 5 Gelifluction features Areas of slow downslope movement of the active layer caused by saturated soils moving over permanently frozen ground. Includes gelifluction lobes, benches, and streams mostly greater than 50 cm high. Common on steep hillslopes. 6 High-centered ice-wedge polygons and palsas Ice-wedge polygons with a raised center portion that is raised above the trough element. Relief between the center and the trough is normally about 0.5-1.0 m, and polygon diameters are usually 10-15 m in diameter. High centered polygons occur marginal to larger streams and rivers, especially on outwash terraces. On some upland surfaces, the polygons are poorly developed or totally masked by tussock-tundra vegetation. Some raised features, particularly in colluvial palsas, which are small peaty mounds with perennial ice lenses. 7 Low-centered ice-wedge polygons Ice-wedge polygons composed of a central low "basin", a raised "rim", and a "trough" between polygons. The basins are usually 8-10 m in width and circular to weakly polygonal in plan. The raised rims of the polygons may be as much as 1-2 m wide, as much as 0.5 m higher than the basin and may compose over 30% of the total polygonal unit. The troughs of polygons occur over the tops of underlying ice wedges, are usually less than 1 m wide. The basins and troughs are usually wet all summer. Thermokarst ponds commonly occur at the junctions of polygon troughs. Low-centered polygons are not abundant in the region but occur in association with flat drained lake basins and river floodplains. pads. 8 Thermokarst land Three situations: (1) Areas with eroding subsurface ice that may be buried glacial ice or ice-rich permafrost; this occurs marginal to several kettle lakes on Itkillik-age glacial surfaces. (2) Thermokarst pits that occur at ice-wedge junctions and often associated with ice-wedge polygons. (3) Beaded streams that have regularly spaced circular pools that have formed where the stream has eroded out ice-wedge junctions; between "beads" the stream often follows a linear channel along eroded ice-wedges. 9 Featureless Areas with no discernible pattern at the mapping scale. However, nonsorted circles, small gelifluction features, and/or poorly-developed water tracks commonly occur in these areas. 10 Well-developed hillslope watertracks Shallow subparallel drainages normally spaced tens of meters apart, with well-defined channels giving many slopes distinctive "horsetail" patterns. Well-developed watertracks carry runoff and meltwater through most of the summer and are usually filled with shrubby vegetation. They are most abundant on long lower hillslopes, particularly slopes that have deep snow accumulation to provide meltwater throughout the summer. 11 Poorly-developed hillslope watertracks Watertracks with poorly defined channels that normally carry runoff only during the snowmelt season and immediately after rainfall events. They are discernible on aerial photographs because of somewhat shrubbier vegetation in the water tracks. Poorly defined watertracks often occur on upper hillslopes and may turn into well-developed watertracks on the lower slopes. 12 Irregular microrelief This unit is used for a wide variety of situations where there is considerable microrelief that cannot be ascribed to any of the above features, such as rolling topography common on till and outwash surfaces, hillslopes and bluffs with irregular erosion features, and floodplains with a mixture of channels, bars, ponds, etc. 13 Stony surface Areas covered by cobbles and stones such as river gravels. 14 Disturbed Includes gravel mines and construction pads. 15 Water Includes lakes, ponds, and rivers. 16 Thermokarst water This code is used in three situations: (1) Areas with eroding subsurface ice that may be buried glacial ice or ice-rich permafrost; this occurs marginal to several kettle lakes on Itkillik-age glacial surfaces. (2) Thermokarst pits that occur at ice-wedge junctions and often associated with ice-wedge polygons. (3) Beaded streams that have regularly spaced circular pools that have formed where the stream has eroded out ice-wedge junctions; between "beads" the stream often follows a linear channel along eroded ice-wedges. 17 Stony surface Areas covered by talus slopes, blockfields, and bedrock areas. 18 Pond complex Wetland areas with numerous ponds mixed with relatively well-drained areas. Walker, D.A. and H.A. Maier. 2008. Vegetation in the Vicinity of the Toolik Lake Field Station, Alaska. Biological papers of the University of Alaska, No. 28, Institute of Arctic Biology, University of Alaska, Fairbanks. Walker, D.A. and N. Barry. 1991. Toolik Lake permanent vegetation plots: site factors, soil physical and chemical properties, plant species cover, photographs, and soil descriptions. Data Report, Department of Energy R4D Program, Institute of Arctic and Alpine Research, University of Colorado, Boulder, CO, USA.